A superb run with five wins and a draw in six games; by most standards that is a compelling argument for consistency. I agree and their overall Composite Possession with Purpose Index rating continues to climb. They’ve (New England) climbed from 17th in PWP (week 5) to 7th after week 11; a superb shift of 10 full places in 6 weeks. So in considering this giant push forward I’d like to take a different approach in how the data points from PWP can be viewed. This is new so please bear with me for a minute or two as I set the context. Below are a number of diagrams referencing my PWP indicators for a few teams; the diagram being used this time is the ‘doughnut’ diagram from Microsoft Powerpoint. The interesting thing about this diagram is that it allows me to offer up a view on my PWP data points that isn’t relative to the exponential relationship (a line). Instead, it allows me to picture the overall tenor of PWP data points in relationship to themselves as being a part of a ‘whole’; with the ‘whole’ being PWP. I feel confident I can take this approach since my Expected Wins 2 correlation for my data points is ~.97 (R2) — as near to rock solid as you can get. Reminder in case my explanation was a bit wordy above – the percentages indicated in the doughnut are not the percentages of those activities relative to the game; they are the percentage of those activities relative to each other with 100% being all those activities added together. Gold Stars on the diagrams are intended to show you where differences occur. The team name on the outside of the doughnut is the outer ring of data and the team name on the inside of the doughnut is the inner ring of data. The volume of Final Third passes successfully completed by New England (29%) is 3% points higher than Montreal (26%). Note also that Montreal has a greater percentage of PWP outside the Final Third (30%) than New England (28%). 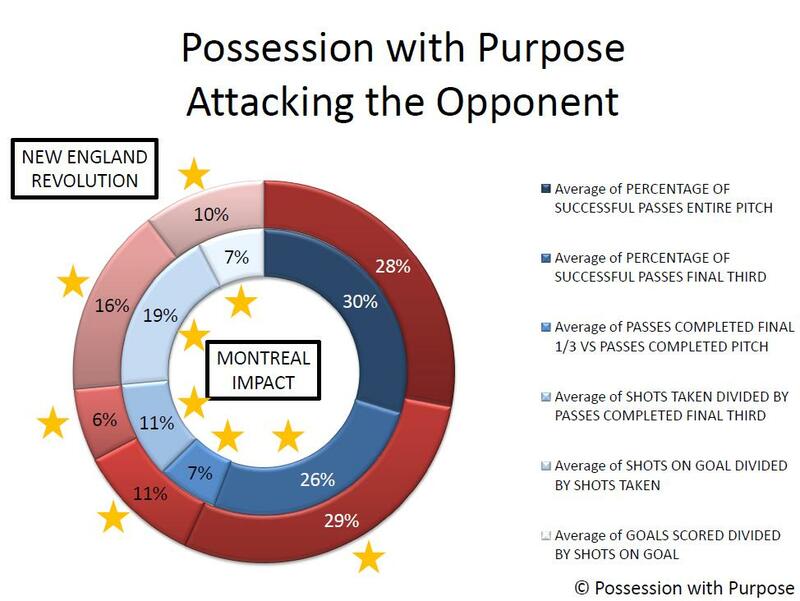 Both of these indicate to me that New England is more focused on penetrating and creating than Montreal. For the future I will check into these three areas when looking to see if a ‘direct attacking approach’ can be better differentiated from a ‘ground-based’ (short passing scheme) approach. The actual volume of penetration is higher for New England as well (11%) versus (7%). And like my regular PWP analysis the data here also supports the fact that teams who are more patient in creating shots taken (6% for NER versus 11% for MIFC) end up with more goals scored. I did ask Matthias Kullowatz about the specific shot data for New England and Montreal; ~60% of Montreal’s shots on target have come outside the prime scoring zones 1 & 2 while ~68% of the Revolution shots on target have also come outside of zones 1 & 2. So what’s different? I think it’s down to time and space again; though it could be the Revolution have better strikers – but when you see the DC United doughnut diagram a bit later I think it’s back to time and space; and with fewer shots taken and more patience in the final third that seems reasonable to me. Notice no ‘gold stars’; why? Because there really isn’t that much difference between how these two teams execute the six steps of PWP. What separates these two teams in the league table are individual mental mistakes in defense – Portland sit on ten points while Seattle have 25. Through the course of this year the Timbers have dropped 7 points due to red cards and penalties – they did both against Columbus Saturday night! All told things went pretty well for Columbus, a red card by their opponent, a foul in the penalty box by their opponent for a PK and a deflected own-goal by their opponent. If I were a Columbus fan I’d be pretty pissed they didn’t win – bad luck for the Crew! However viewed I’ll revisit this diagram later when the Cascadia Cup battle heats up. So here’s the doughnut view of New York compared to DC United last year and then a bit further down how they look compared to each other this year. First off – let’s not forget Ben Olsen was not fired and perhaps this doughnut diagram can also help explain why given the overall poor performance in results last year for DC United. 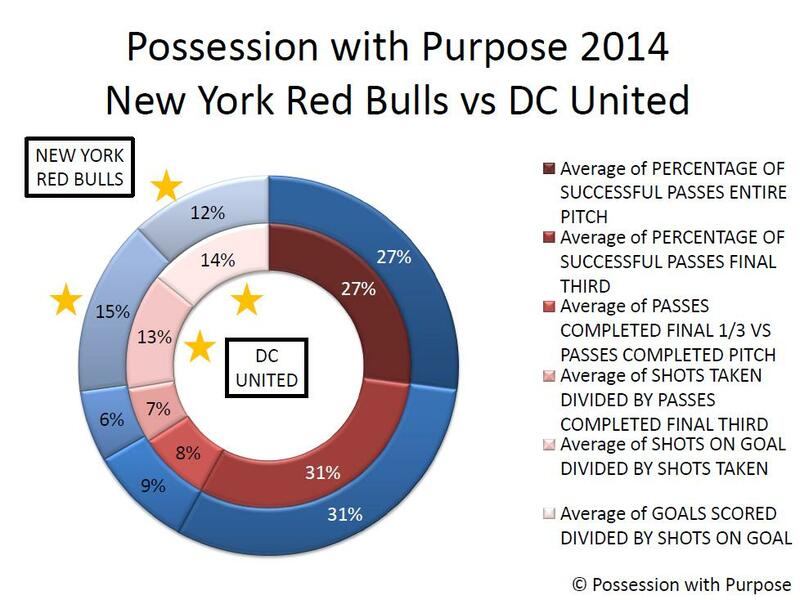 Notice that the team does exceedingly well in comparison to New York with respect to Passing, penetration and creation; they actually exceed New York in the first two categories and only fall off when it comes to goals scored (7% for DC United versus 15% for New York). So I’d offer that the system Ben Olsen ran last year worked – what he lacked was a pair of good strikers. And if you recall the Montreal doughnut earlier the outputs from DC United do not mirror those of the Impact! Note the increase for DC United in the final category – goals scored versus shots on goal – pretty compelling information to reinforce that the system used last year is the same system used this year and the difference – major difference – is the addition of two quality strikers. I’m just in the learning stages on how this new doughnut diagram will take shape – I’m pretty sure it will have at least one hole in it – I’m hopeful there aren’t a lot more. Some changes afoot with OPTA and MLS – I see OPTA incorporated the Final Third Passing Accuracy suggestion – just need to find out if crosses are included in that metric??? As for This Week in PWP; if you saw my tweets yesterday you know the top Attacking and Defending PWP teams of the week; New England in attack and Toronto in Defense with the Reds taking the Composite PWP Index top spot for Week 11. Sporting KC, along with LA Galaxy remain atop the Composite PWP through Week 11 while the Revolution moved to 7th and Columbus dropped to 4th as Real Salt Lake are now in a comfortable position of 3rd best overall. Finally, this view also gives you and idea of what percentage each team gleans from each of the PWP Six Steps data points in the calculation for the overall Index number. This entry was posted in Possession Stats Analysis, Possession with Purpose, Team Analysis and tagged DC United, Expected Wins, Montreal Impact, New England Revolution, New York Red Bulls, Portland Timbers, Possession with Purpose, Seattle Sounders. Bookmark the permalink.